burial: Rev. Hans Tschantz graveyard, south of Lampeter, 8 miles southwest of Lancaster, PA, between the Willow Street (or Brick) and Strasburg Mennonite meeting houses. Children: Exact names & dates uncertain. We believe these children represent the separation of the Virginia and Pennsylvania Bowmans as well as the Lancaster/Berks County families. Some Baumans moved to Maryland. 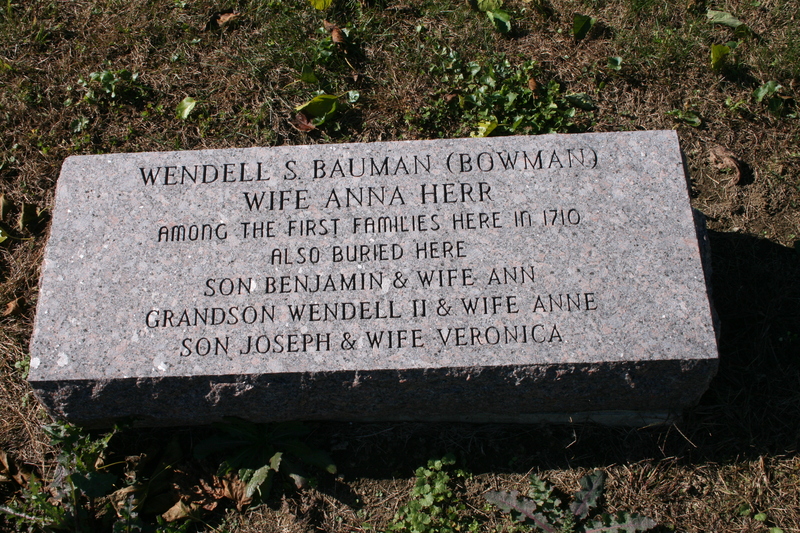 This family represents the evolution of the surname from Baumann (Swiss) to Bauman (Eastern PA) to Bowman (VA & Somerset County, PA) as Swiss-German & English-speaking public officials recorded their names. * The H.M. Bowman writing has these sons moving from Pequea 25 miles northeast to Alleghany Creek, Berks County in the 1740’s. This Jacob, the youngest, he claims, was nicknamed “Nimrod of the Pequea country”# because of his prowess at hunting and fishing. Other sources has this Jacob “Nimrod” (1743-1803) as the son of the above Jacob “Brecknock” Bowman, Sr. (1722-1788) born in the Palatinate, marrying Veronica/Verina, fathering 15 children, and dying in Brecknock, Berks County.